It’s that time of the year. We have less than one month left to wrap it all up. In today’s episode of the IT Provider Network Podcast, I want to walk you through some of the things we do to plan for the upcoming year. December is always a crazy month for us. We are a Sub Chapter S corporation which is a type of tax structure in the US that requires that your corporate year end on the calendar year. So most small businesses are scrambling in December to wrap everything up and get their financials in order to minimize their tax position. Reflecting on what you have done during the year to help us going forward. Making Plans for the next year based on what we have learned. Let’s get right into the financial work that we need to do at the end of the year. Just like life, after January 1st there are rarely any do-overs. So you need to make sure you have everything in your business the way need it to be before you close out the year. Here are some financial things you should take care of, and let it be written – let it be said. I AM NOT A FINANCIAL ADVISOR. If you are the owner and you are also a W2 employee then you need to make sure you have satisfied the “safe harbor” requirements of the IRS or that you have made sufficient estimated tax payments to cover your W2 income and any other disbursements from the company. This will ensure you don’t pay any penalties. If you have a company retirement plan like a 401k or IRA. Make sure you are taking full advantage of the tax savings that this affords you. If you are over 50 (like at least one of us) then you can even do catch-up contributions. Today that means you can sock away an extra 6 grand. If you were lucky enough to have a profitable year, you need to look at your tax liability and see what you can do to minimize your exposure. Talk to your accountant about this although they usually aren’t much help. A common strategy is to get your bank account down as low as possible before year end to minimize the tax liability. This is sometimes a double edge sword. You might have loan covenants or guarentees to the bank that you are going to have some cash. You also might need some cash to actually run your business in the next year! Paying yourself a bonus, taking a shareholder distribution, repaying your owner loan, paying down credit card balances, paying down credit lines, or paying off other debt will not create deductions that result in tax deferrals. These strategies are simply re-distributing the money that belongs to your business, into other forms that are still tied to the company in some way, and thus don’t qualify as operating expenses. If you are going to put this plan in place, you must actually be paying expenses or purchasing equipment that goes toward improving or maintaining the operation of your business. “Revenue is Vanity, Profit is Sanity, and Cash Flow is King”. Look at all your recurring charges. Products and services, you are using or not using in your business. Now might be a good time to pre-buy for next year or to cancel if you are not getting value for the expense. Gifts or Cards If you are going to send your customers a holiday gift you should have this ready to go by the 2nd week in December. Often, I know we are scrambling to get something out before the holiday week. Try to avoid the added stress and plan early. If gifts aren’t in the budget or that’s just not your thing then at least send out a card. I usually have everyone in the office sign the card it’s a nice touch. Bonuses – If you are going to give a holiday bonus you want to get this in the hands of your employees before Christmas if possible. Different companies have different opinions on the “so-called’ Christmas bonus. I think it spreads goodwill but like everything with compensation, it can get complicated. How much do you give? How much did you give last year? Do you give more to the more senior people? How about the more tenured people? These are all tough questions that you will need to navigate for yourself.If cash is tight and you can’t give a bonus there are other ways to show you appreciate your staff. Maybe have them over to dinner, or take them out to eat. If nothing else, give them a day off with pay. Ok, you have your finances in order and you have done your best to cook the books for the tax man. Now its time to look back on the year and see what you have done well and maybe not so well. You should also think about what is happening in our space as well as any of your clients’ markets and see how that is going to affect your business going forward. We are in an ever-changing market and some in the space predict that doom is right around the corner. Ingram Micro’s President, Paul Bay, just last week shocked the crowd at their conference with the news that a study predicts that up to 70% of MSPs and Resellers won’t make it through the digital disruption. We need to move and shake, we need to reinvent ourselves for the world that is changing around us. The end of the year is a perfect time to do this. I suggest you take your income statement. Specifically, everything you sell and sort it from most profitable to least profitable and make some hard choices. You need to either figure out how to make it profitable or dump it. Here are some levers you can use to get more cash and most times profit into the company. Increase the Price – This one is easy if you can charge more. Reduce the Stock Days – Doesn’t really apply to most of us. Don’t keep stock on anything you don’t have to. Increase your Credit Days – HP, Cisco, and others often have extended terms for registered deals. Use this cash and these extra days to your advantage. Talk to your distributors especially if you have a large deal. I always negotiate the best pricing and extended terms. Slow down the payments a little if you need to. Verne Harnish in Scaling Up talks about the Power of One. If you haven’t read this book, I suggest you get it right away and start putting the principles to work. The power of one is a calculator that will show you the ENORMOUS effect changing each of these levers by 1% will have on your business. After you have looked at the financial successes or failures from last year. Look at some less tangible things. Get your team together and ask yourselves these questions. • What are we grateful for that occurred this year? • What did we do really well? Projects, Onboardings, Hirings, Meetings. • Thinks about the clients you landed. What can you do more of to get more clients? • How about any churn. If you have lost any clients, what could you have done to prevent this? • What is happening in your clients’ industries, how is it going to affect your business? What can I do to explode my business next year? Ok – now take a little time and let all of this set in, like a week or so. Keep on your team to be coming up with forecast targets, ideas, and methods to achieve your goals. 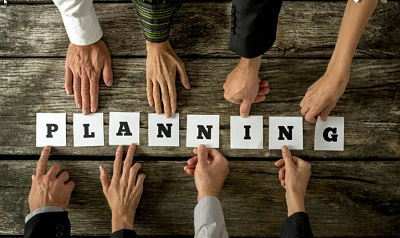 Remember a goal without a plan is just a wish,(you can tweet that by highlighting that) so the team needs to be working to create a plan for the next year. When you wake up in the morning ask yourself this question. It’s important that you frame the question in a positive way and do it first thing in the morning. Once you let the data cook for a little while, get the team together and come up with metrics and a plan for the upcoming year. In our process, we have 5-6 key performance indicators or metrics and 3-5 key initiatives for the year. Each metric has a forecasted value along with values for below target achievement and above target achievement. As the year progresses we use these values to see how well we are doing against the goal. The initiatives are just statements at year end. Like the metrics or KPI’s every initiative has an owner. The owner is responsible for fleshing out the initiative and making sure it is properly scoped. I’ll give you an example. For next year, I have two metrics and one initiative that I am responsible for spearheading. The metrics are around new clients. They are “New Clients” and “Total Clients”. We define a client as an entity that we have invoiced in the last 13 months. We determined the values we are shooting to obtain next year by looking at our customer acquisition rate and our churn rate. For next year we tried to increase the acquisition rate and decrease the churn rate. So our metrics for “New Clients” and “Total Clients” were based on this year’s achievement plus a factor of x%. Most of our metrics are pertaining to sales and finance, in my opinion, this is the heart of any business and deserves the most attention. Without revenue and cash, you have nothing. As techies, we often gravitate to the technical stuff but to be a true entrepreneur you need to focus on sales and profit. This is a mouthful and really was a combination of two initiatives. Better communications in everything we do and execute a marketing plan. That’s another thing you need to think about when creating your initiatives. Less is more. You need to make tough choices. Not everything you want to get done can realistically get done. You and your team need to cut and prioritize so that you have the most import 4-5 initiatives on the plan. That’s the bulk of how we plan. There are some important things to remember for success. 1. Everything you are going to monitor, measure and improve needs an owner. That person is responsible for moving the initiative along and creating smaller initiatives that will move the company to achieving their goals. They are not necessarily responsible for achieving the goal. 2. The plan needs to be written down. Preferably in a way that the management team can collaborate on it. Don’t go crazy here on the formatting or the technical details. A simple Google sheet or Office 365 shared doc will work fine. 3. The plan needs to be nurtured and worked. Start the year out by putting set meetings on your calendar and make strategic planning a priority.